1914 Star – Regimental number 9661, Rank Private, date of embarkation 28th August 1914. Discharged Para 392 (xxi) K.R. 3/1/16 -Termination of his period of engagement. Granted under Army Order ii of 24 Nov 1917. Schooling	Admitted to Vauxhall Street, Lambeth on 26th Feb 1894, address 78 Vauxhall Street. Left school 1st July 1898. Enlisted at Thame on 4th January 1909 for a period of 6 years, aged 18. Trade: Labourer. Religion Church of England. Initial Regimental number 7661. 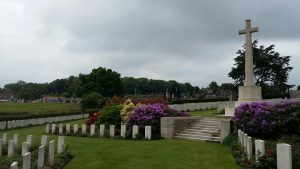 Action:	23-24 August 1914 Mons; 23 Aug–5 Sep 1914; Retreat from Mons; 7-10 Sep 1914 Marne; 12-15 Sep 1914 Aisne; 9 Oct – 22 Nov 1914 Ypres; 21-24 Oct Lengemarck; 29-31 October 1914 Gheluvelt; 11 Nov 1914 Nonne Bosschen. Wounded: at Pelle Chappelle (?) 31st Dec 1914 – Gun shot wound to the chest, admitted to ambulance. Cow pox – 5 days in Oxford hospital, 18th Jan 1909 to 22 Jan 1909. St. Omer was the General Headquarters of the British Expeditionary Force from October 1914 to March 1916. Lord Roberts died there in November 1914. 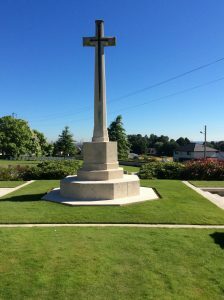 The town was a considerable hospital centre with the 4th, 10th, 7th Canadian, 9th Canadian and New Zealand Stationary Hospitals, the 7th, 58th (Scottish) and 59th (Northern) General Hospitals, and the 17th, 18th and 1st and 2nd Australian Casualty Clearing Stations all stationed there at some time during the war. 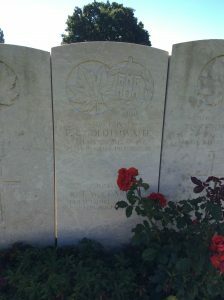 St. Omer suffered air raids in November 1917 and May 1918, with serious loss of life. 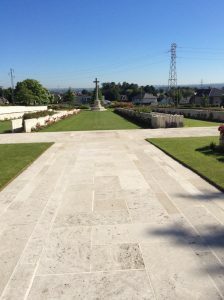 The cemetery takes its names from the triangular cemetery of the St. Omer garrison, properly called the Souvenir Cemetery (Cimetiere du Souvenir Francais) which is located next to the War Cemetery. 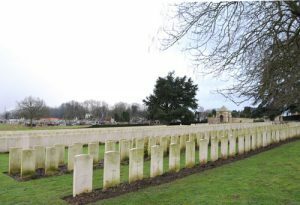 The Commonwealth section of the cemetery contains 2,874 Commonwealth burials of the First World War (6 unidentified), with special memorials commemorating 23 men of the Chinese Labour Corps whose graves could not be exactly located. Second World War burials number 403, (93 unidentified). 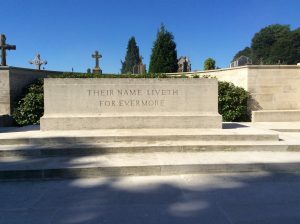 Within the Commonwealth section there are also 34 non-war burials and 239 war graves of other nationalities.